Not one, but two experimental pedal steel guitarists with completely distinct styles on one bill! Without forsaking the instrument’s ties to country music, these two innovators take it into a whole new realm of sonic possibilities. 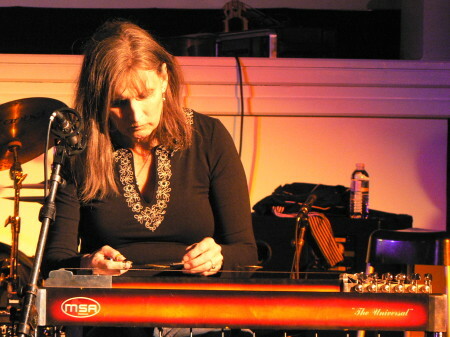 Susan Alcorn (Houston), having cut her teeth on the Texas c&w scene, found inspiration in the music of Coltrane, Monk, and Ornette Coleman, 20th Century composers such as Messaien, Penderecki, Varese and Piazzolla, and various world music traditions. She has forged an individual style that draws on elements of free jazz, contemporary classical, minimalism, Indonesian gamelan, Indian ragas, Tibetan Buddhist chant, and the Nueva Canción of Latin America—not to mention her country roots. Primarily a solo artist, Alcorn has collaborated with accordionist Pauline Oliveros, bassist Peter Kowald, and improv guitarist Eugene Chadbourne. Chas Smith (Los Angeles) was perhaps the first to carve a niche for the pedal steel guitar in the world of experimental music. His compositions display a dualistic fascination for the scientific and the sensual, reflecting an aesthetic inherited from the composers with whom he studied in the 1970s: Morton Subotnick, Mel Powell, James Tenney and Harold Budd. So it’s no surprise that Smith’s music embraces both minimalist beauty and complex noise, and is equally capable of evoking images of a shimmering desert landscape or a swarm of locusts. He has also designed and constructed a fascinating series of original instruments in the spirit of the maverick microtonal composer Harry Partch.